I have 16 years’ experience as a web content manager and digital strategist. I have created websites and communities for various publishers and brands including creating and project managing the Guardian mobile website (AOP 2010 shortlisted) and creating startups.co.uk, the AOP Business website 2003. MoreThan – I worked for Insurer Royal Sun Alliance on their Morethan.com and echoice.com websites. As both a Web Effectiveness Consultant and as a Business and Technical Architect. My role involved helping the e-business team to create Agile solutions to improve the customer experience. As part of the role I championed the introduction of a customer feedback system for the social media team, and this is now used by the RSA board to measure and steer customer relations in the business, Additionally I worked on a customer segmentation strategy for the business. Firebrand Training – Creating offline and online material and product development on their new apprenticeship and corporate training products. Additionally writing blogs and developing in-house sales manuals. 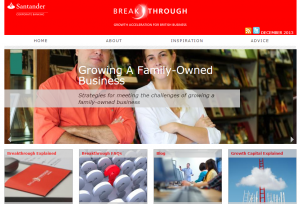 Vodafone – I developed the BizGene website strategy and the content for Vodafone via Republic Publishing to help them talk directly to small business owners who were interested in mobile technology and how it could be applied to business. Santander – The Santander Breakthrough site was developed by publishers Engage and myself to help Santander communicate with fast growth businesses. I edit and write features, case studies and copy for the site, and for their above the line advertising campaigns. Techradar – I helped develop Techradar’s Business website Techradar Pro for Future Publishing. I decided on the sections and the structure of the site, created and commissioned articles for the site and once launched edited the site for 10 months including writing features and news as well as commissioning pieces from freelancers. IBM – I also provided web content and content strategy for the IBM web site YourBusinessVision.com through Crimson Business, this was part of an ongoing project that I started in 2005. BT – Editing BT Upload Innovate ezine and the award-winning BT Upload magazine and doing development work on the restructuring of the BT Insight website for Redwood Publishing. The job entailed editing, creating and commissioning content, liaising with BT product managers and developing themes that would work across the magazine, website and ezine. Internet Retailing – I edited the Internet Retailing website aimed at FTSE top 200 e-retailers and wrote a twice-weekly email overview of the latest ecommerce news. I also wrote extensively for the magazine on multi-channel ecommerce and mobile commerce. Dixon’s Group – Creating an app/ezine for Apple and Equinix/Dixon’s Group to illustrate their mobile technologies to IT directors. The project involved extensive work with Dixons Group and Apple.